"Joe and I had been forthright about children. I was pretty sure I wanted them, Joe was pretty sure he didn't. Since we each perceived in the other some room for movement, the difference didn't worry us. Then priorities shifted, needs changed...."
In her late thirties, journalist Jill Smolowe's life and career at Time magazine was on track. Her husband, Joe, was still her most trusted confidante and best friend. And now that she and Joe had decided finally to have a child, Jill assumed the pregnancy that had come so easily to all the women in her family would be her own next chapter. But nature had a different script in mind. 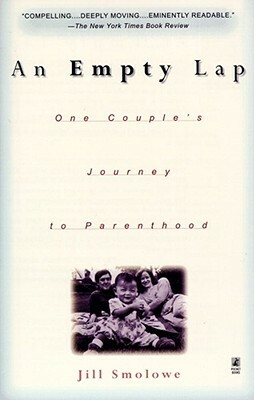 As her quest for a child swerved from the roller coaster of infertility procedures toward the baffling maze of adoption options, Jill's desperation deepened -- while Joe's resistance to children only hardened. In the fog of depression, disappointments, and dead ends, their marriage began to founder. Then, halfway around the world, in Yangzhou, China, she encountered a future she'd never imagined might be hers. Honest and intimate, An Empty Lap is as much a window on a marriage as on a high-stakes baby chase. Compelling, beautifully told and as insightful as a novel, it's filled with emotions that anyone who has yearned for a child will recognize. Jill Smolowe is an award-winning veteran journalist whose articles have appeared in Time, Newsweek, The New York Times, Boston Globe, People, Family Life, Adoptive Families and other publications. She lives in New Jersey with her husband, Joe Treen, an assistant managing editor at People, and their daughter, Becky. [A] heartwrenching account...readers of either gender will relate. Engrossing....Smolowe's unromanticized understanding of what it takes for two highly opinionated adults to work through some of coupledom's most stressful challenges is what gives this book its appeal....She makes compelling general-interest reading out of a special-interest subject. Reading An Empty Lap is like staying up all night listening to a friend filling you in on the important events in her life. You know how things turned out, but you want to hear all the details. Jill Smolowe's honesty is compelling. It's like a thriller, only the terrain is emotional. Extraordinarily moving, and wonderfully written, An Empty Lap is one woman's account of love, hope, lost hope, and then, finally, great and well-earned joy. The book is completely engaging. Jill Smolowe and her husband endured much to adopt a child but, when at last they succeed, their delight is utterly and boundlessly contagious. The complexities and resilience of their love story are woven together in a riveting way.